What is the purpose of Personal Cards Manager (PCM)? Why do you need PCM if every e-mail client has own address book? 2. The second argument to start using PCM: Usually you temporary keep e-mails, phones and names in plain text files or little pieces of paper. PCM is the perfect tool to sort your records. 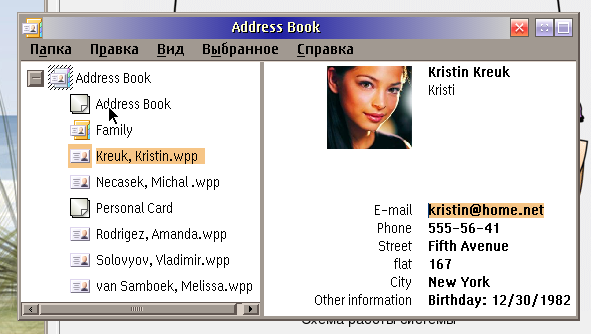 You can create Address book using the template of Address book: drag&drop the template to desktop - voila! address book is there. Open it, it seems like standard folder with extra features. Collect WPPerson cards there. Card is a file on your disk. If you open it via desktop (click it), you can see notebook: PIC: opened card. To create good quality photo cut off the top of the head. Such photos seems more attractive. Create shadow of main Address Book on every client PC. Personal Cards Manager opens the door for syncronization with personal mobile assistants and phones.